Hong Kong is a city of protest. While the Umbrella Movement protests of 2014 captured the world’s attention, they were merely the latest and largest iteration of an ongoing series of political protests in Hong Kong stretching back decades, including a particularly lively recent past since the return of sovereignty to China in 1997. Hong Kongers are renowned for being pragmatic, and there is indeed a pragmatic reason for protesting in Hong Kong: it often works. In many cases, protesters’ demands have been met, most notably overturning the Article 23 anti-subversion legislation in 2003, forcing Chief Executive Tung Chee-Hwa’s resignation following protests in 2004 and scrapping the Moral and National Education Curriculum in 2012. Over many years, Hong Kongers have been conditioned to view protest as an effective means of forcing political change in their city. However, this pragmatic explanation is only the beginning. There are deeper cultural and structural forces driving public protest in Hong Kong. In a city whose population identifies itself – at least vis-à-vis its sovereign, the People’s Republic of China – by reference to the rights and freedoms it enjoys which the rest of China’s population does not, protest is an embodiment of that identity, embracing as it does the freedoms of speech, expression and assembly. But beyond the spectacle itself, the vibrancy of Hong Kong’s protest culture has a greater significance. The authorities’ tolerance of and reaction to public protests serve as a barometer of the health of the unique ‘One Country, Two Systems’ principle under which sovereignty over Hong Kong was returned to China, as well as of Beijing’s disposition towards Hong Kong and its freedoms. By extension, that reflects China’s own future. Will Beijing permit the rest of China to become more open, a reflection of the Hong Kong experiment? Or will Hong Kong be forced to converge with an unyielding China as we approach 2047, the year when the fifty-year guarantee of Hong Kong’s rights and freedoms expires? The Umbrella Movement of 2014 was the crucible in which these questions were tested. Hundreds of thousands of protesters took to the streets to voice their demands for political reforms, blockading and occupying the business and commercial heart of the city for seventy nine days. While the protesters’ demands – at least for now – have gone unanswered, the movement marked a new high point for political protest in Hong Kong. The Umbrella Movement unfolded, literally, on my doorstep. My commute to my office in Central was transformed from a twenty-minute trudge along heavily trafficked roads into a daily carnival. Every night I would join the other curious office workers stopping by on the way home from work, picking my way between rows of brightly coloured tents on the occupied highway, browsing through the latest artwork or enjoying an ad hoc musical performance. As I sat talking to protesters at the front-line barricades late into the muggy tropical nights, or mingled with the crowds enjoying the craft market atmosphere on weekends, I reflected on the numerous protests I had witnessed during my fifteen years in the city. I recalled hundreds of thousands of Hong Kongers wearing black T-shirts and marching late into the night of 1 July 2003 to overturn a draconian anti-subversion law; Korean farmers in orange life jackets engaged in pitched battles with police in the narrow back streets of Wan Chai during anti-WTO protests in 2005; candlelight flickering on the faces of Hong Kongers young and old as they gathered in Victoria Park every year on 4 June to remember the Tiananmen demonstrations of 1989. Looking back on Hong Kong’s long and vibrant history of public protest, I realised that the Umbrella Movement was not just an isolated event but part of an ongoing narrative, a narrative intertwined with the city’s very history as it transitioned from a colonial out-post to a bustling trade entrepôt to a dazzling Asian financial centre, and as it navigated its way from the last outpost of the British Empire to reunification with a rapidly developing China. At every point along this journey, Hong Kongers have taken to the streets of their city to voice their hopes, fears and dreams. In this book I explore the role of protest in Hong Kong life, and place the Umbrella Movement in the context of Hong Kong’s protest history. 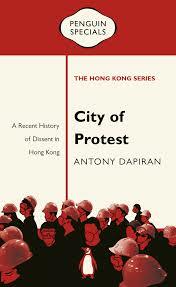 I try to understand what it is that has made political protest such an important part of the Hong Kong way-of-life. And what might the prospects be for Hong Kong’s – and therefore China’s – future? Details: City of Protest is published by Penguin in paperback and eBook, priced in local currencies.